NEW YORK, New York – HARMAN’s Studer today announced that Dale Pro Audio, one of the most successful professional audio dealers in the United States, has expanded its product offerings with the addition of Studer’s Vista 1 digital console as a new customer solutions option. The addition of Vista 1 consoles to Dale Pro Audio’s inventory is part of a new relationship between the companies to better serve the audio community, which also underscores Dale Pro Audio’s long-term commitment to the broadcast market. The Vista 1 is now available for demo, along with accompanying studio monitors and outboard gear, at Dale Pro Audio’s Queens location. Based in New York City, Dale Pro Audio has served the broadcast, live sound, contracting, and studio and post-production markets for more than 50 years. Dale Pro Audio co-owner, Valerie Lager, commented, "We are proud to be associated with the Studer brand, and our new relationship comes at a perfect time. The Studer Vista 1 console fits in well with our current initiative to further expand our offerings and service to the broadcast market, and we're confident it'll serve our clients well." The Studer Vista 1 digital console is highly suited to both fixed and portable systems, while its compact size makes it a natural choice for OB and ENG vans. It is equipped with Studer’s exclusive Vistonics™ user interface and Vista control surface, plus features such as true broadcast monitoring, talkback, red light control, GPIO, N-x (Mix Minus) busses, snapshot automation and DAW control. With an integral DSP engine of 96 channels, the Vista 1 can handle mono, stereo and 5.1 inputs with ease, and is provided with 32 mic/line inputs, 16 line outputs and eight stereo AES inputs and outputs on rear panel connections. 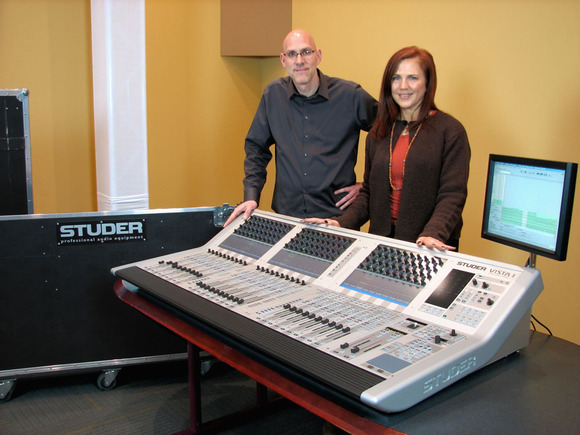 Photo Caption: Dale Pro Audio e-Commerce Director, Tim Brown, and co-owner, Valerie Lager, proudly display the new Studer Vista 1 console being installed in Dale Pro Audio’s demo room.